Housing, canopy, spigot: die-cast aluminium EN AC 47100 powder coated texturized anthracite grey (close to RAL7043). Additional treatment for coastal atmosphere as variant. Decorative LED lantern with great versatility. With up to 13 600 Llm, efficiency up to 139 Llm/W. Offering 6 mounting variants : post top amenity, post top, lateral, suspended, wall mounted and catenary. 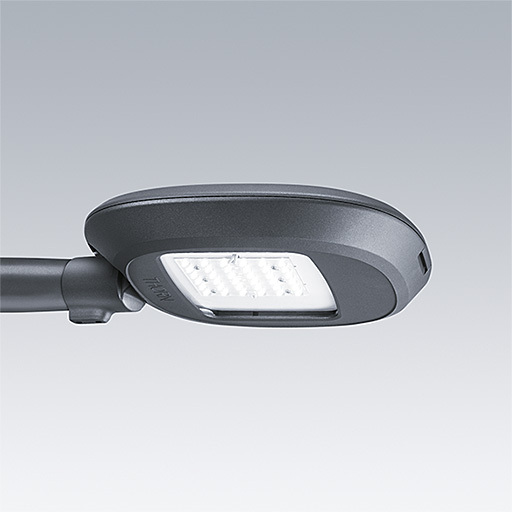 Wide optical offer with efficient Street R-PEC and Area lighting optics, 26 light distributions (symmetrical and asymmetrical) with a performance clear or prismatic comfort variants. 4000K, 3000K, 2700K colour temperatures, as standard. Internal back light control louvre, as an option. 10KV surge protection, as standard. Street variant : post top mounting for diameter 60mm or 76mm, lateral mounting for diameter 60mm or 42 mm. Tilting possibilities from -20° to +10°. Amenity variant : post top mounting for diameter 60mm, 76mm with adaptator. Suspended through 34G. DALI and BPS as standard, or LRT, PL, RF (InCity), MD presence detection, PN7 socket. Offering dedicated columns.